Say hello to summer in the Pacific Northwest. Summer in Oregon is the best. We're talking the sky is the limit as far as outdoor adventures go. Hiking, fishing, climbing, rafting, camping, and yes, even downhill skiing. During the most recent heat wave, my brother and I took to the Willamette River for an afternoon of kayaking. It was a slightly more of an adventure than anticipated, although that made the afternoon all the more fun. of the day. As the afternoon continued to heat up, more and more boats came to play on the water. A few boats were a little curious and decided that it would be fun to spin cookies nearby. One boat's wake came in stronger than we thought and our kayaks went rolling over the waves. All of a sudden, my brother was in the water with a flipped kayak. We burst out laughing, trying to get everything and everyone upright. 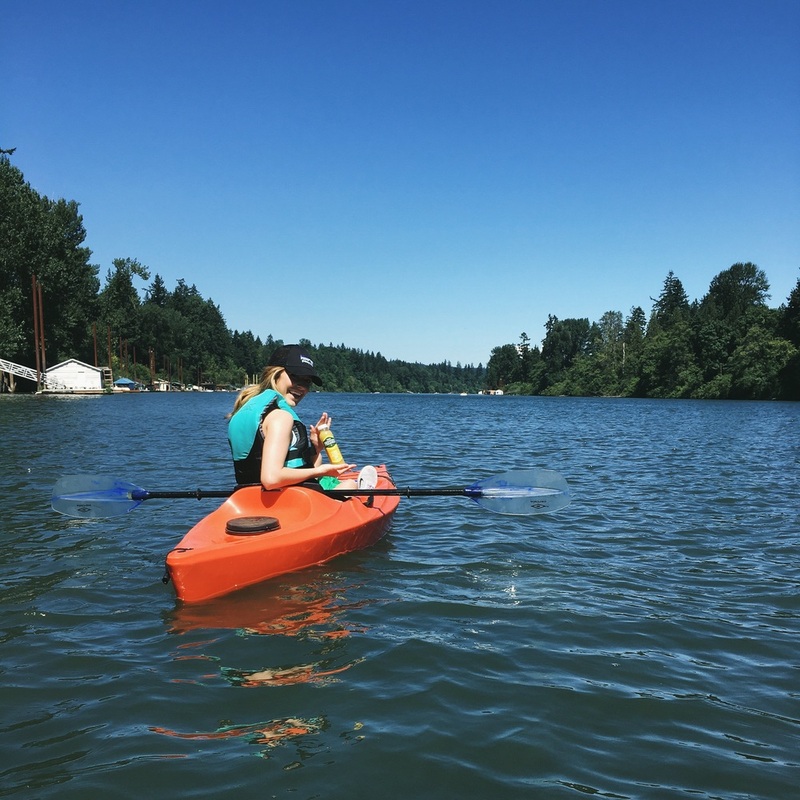 We paddled off to shore to take a snack break and hydrate with Naked Juice. The five new flavors of Naked Pressed feature all natural fruits and veggies— much-needed fuel for the second leg of our adventure. My personal favorite juices are the Lively Carrot and the Cool Pineapple. Feeling energized, we strategized the best route and set off on the last part of our journey. After our 4-hour Tour de Willamette, we rounded the last corner and spotted the dock! We then quickly realized that the only obstacle that stood between our tired shoulder muscles and dry land was the Canby Ferry. It took a little timing and a sprint across the ferry waterway— not that it was a close call but it was definitely an adrenaline rush all the same. Do you have any favorite spots to kayak in Oregon or beyond? Let me know! I'm hooked on this new sport. Do you have any Oregon adventures planned this summer?